Here is the winter issue of the 'Hyakunin Issho' newsletter - this time looking both back to the past, and forward to the future! 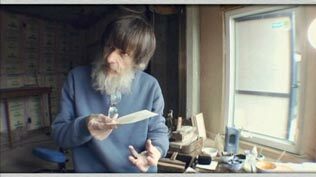 When I say 'back to the past' I mean simply that we are going to pick up and resume a series of stories that used to be common in this newsletter, the 'Visits to a Craftsman'. And as this is a new year, we'll also have a story that looks back over the media activity of the past 12 months. As for the 'forward to the future', well that of course is the announcement of the new print series. One year ago at this time I surprised everybody with my plan to create just one print during the year. But I'll bet that you'll be much more surprised when you read about the next project! This magazine is well known in many places overseas, but is fairly new here in Japan - it is published for the benefit of the homeless, and is distributed by them outside train stations. 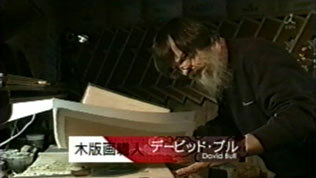 They ran a feature on people working in the field of traditional crafts, and I was selected to be included. 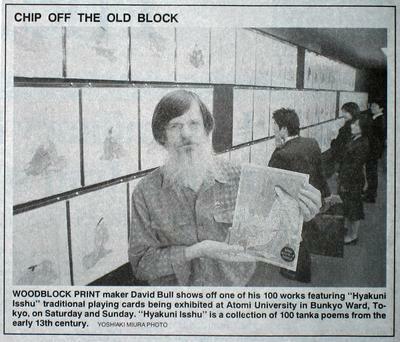 Quote: "David continues to produce his woodblock print reproductions not from any desire to maintain the old traditions, but simply because they are beautiful ..."
This is a general interest magazine produced by the national agricultural cooperative, to be sent to pension recipients. 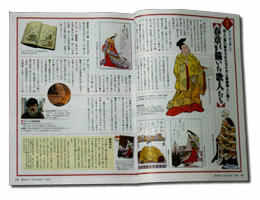 For their year-end issue, they did a feature on the Hyakunin Isshu, and included a nicely produced two-page story on my prints of the old poets. Interviewer: "Which is your favourite among the Hyakunin Isshu prints you have made?" David: "I can't answer such a question. Imagine please, if somebody asked you which of your children you like the most. Could you answer?" I was a bit surprised when the editor for this magazine called me up and asked to talk. It is produced by an organization concerned with immigration affairs, and my first thought was a concern as to whether or not my residence paperwork was all in order! But I had nothing to worry about - they were simply featuring 'foreigners immersed in Japanese culture' in their monthly magazine, and wanted an interview! 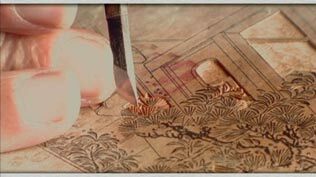 Quote: "It's a shame, but most Japanese people these days - including many of the printmaking craftsmen - have forgotten the true beauty of woodblock prints. I am coming to believe that one of my main jobs from now on should be to introduce them to this beauty ..."
Quote: "David said 'The delicacy of the carving, the subtlety of the colouring, the beautiful washi ... 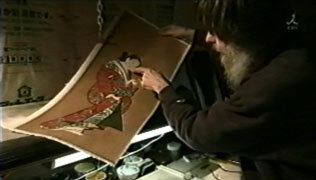 There is nothing in the world as fine as the Japanese prints of the Edo and Meiji eras.'" "Hyakunin Isshu prints become 'Colouring for Adults'"
After my new colouring book was published in the fall, it was featured in this story published by the Yomiuri Shimbun. Quote: "David's prints appear in black outlines only, ready for the purchaser to colour in the images in any way they choose." Not a full story, just a photo of me showing off the new colouring book while standing in front of the entire set of 100 Hyakunin Isshu prints; they were on display at an exhibition put on by Atomi Women's College. NHK's international radio division asked me to do an interview for their overseas English-language service, and I was happy to accept. Although talking about art work on the radio is sometimes challenging, it's not very often that I get a chance to talk about my printmaking in English! 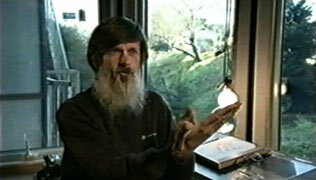 This was a new experience for me - an appearance on a 'new media', a DVD 'magazine'. 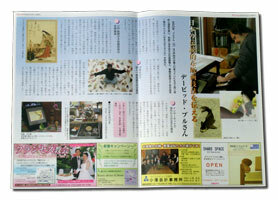 The contents are similar to a print magazine, a combination of features and advertising. 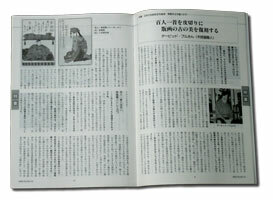 The feature for this issue was 'Sides of Japan Unknown to most Japanese' ... and that certainly includes what I do! Sekiguchi Hiroshi's "Let's Discover Japan"
The good news ... a two-hour feature program on foreigners involved with Japanese traditions! The 'bad news' ... my corner was only around 2 minutes long! :-) But it is gratifying to see yet again that society here really does seem to appreciate the kind of things that 'we' are doing here! Who knows what this year will bring? Back in the early days of this Hyakunin Issho newsletter, a feature that appeared a number of times each year was a report of a visit to one or another of the craftsmen working in this field. I visited not only carvers and printers, but craftsmen working 'behind the scenes', the people who provide the tools and supplies needed for making woodblock prints. In recent years I seem to have let that series lapse; I suppose partly because I have felt less need to visit other craftsmen for advice on my work. But with the startup of my new Mokuhankan publishing venture, I have found myself again in contact with other workers, and that provides a perfect excuse to get that series up and running once more! All of the men I wrote about in those earlier issues were quite a bit older than me, but we'll bring things back into balance with this report; today's craftsman is my contemporary - we were born just two months apart! 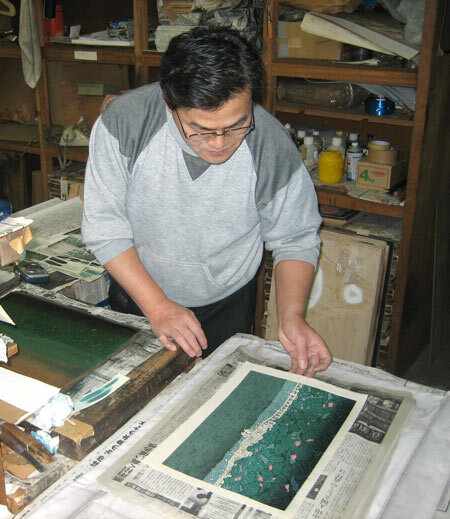 When I heard printer Shinkichi Numabe tell me about how he first got interested in woodblock prints, I had to do a double take - it was so similar to my own experience! In my case it was a random meeting with some prints on display as I walked down a street in Canada; in his case he popped into a department store for a quick bit of shopping, and came across a display of prints. For both of us, the chance encounter led to a complete change in life direction. Just prior to that encounter, Numabe-san had spent a couple of years at an 'Art Institute', but was finding - of course - that making a living in the art field presented severe difficulties. What he saw in the department store that day though, opened the door to something new, because the prints weren't just on display, there was a craftsman there demonstrating the process. Having done plenty of demonstrating myself, I can easily imagine what must have happened that day. When you are sitting there printing in public, most people stop and watch for a minute or so, and then wander on. A few people stand and watch for a bit longer ... and then wander on. But every now and then somebody comes along who stands and watches, perhaps starts to move on, but who then hesitates a bit ... stays to watch a bit longer ... and then a bit longer. Something has 'caught' their attention, even though they could probably not explain exactly what it is. It might be the attractive colours on the sheets, perhaps the smooth and relaxed movements of the craftsman, perhaps the curious contradiction of such glorious results appearing seemingly by magic from such a simple process. In any case, Numabe-san was hooked. Nakajo-san, the printer that day, introduced him to a workshop where he was able to work as a trainee for a while, and then, after enough time there for Numabe-san to show that he was going to stick with this, took him under his own wing for more extended training as an apprentice. In the early stages of learning this craft, it is impossible to produce work that will 'pay its way', so Numabe-san worked at various part-time jobs while developing his printing skills. 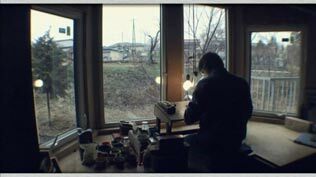 But because he was a person who had come to this by choice, and not by being 'sent' to the trade, his skills developed rapidly, it was not long before he was standing on his own feet, and he has now become one of the most respected printers in Tokyo. 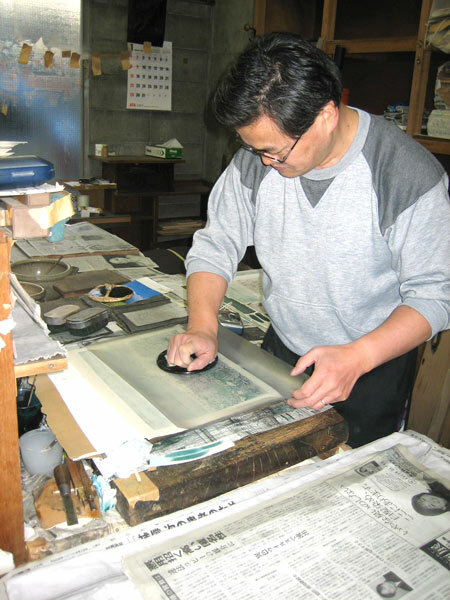 Far and away the bulk of the work that Numabe-san sends from his bench is 'anonymous'; the publisher sends him a set of blocks, he pulls an edition, and the prints - which almost never carry Numabe-san's name - are then sold by the publisher. When I approached him to do work for my Mokuhankan project, I told him that wherever possible (in the case of prints that had margins), I want to put the craftsmen's names on the print. He certainly didn't demand this, but neither did he reject the idea; I think that, like me, he is quietly proud of his skills, and would like to think that the presence of his name on the margin of a print would come to be seen as a mark of a well-made product. If you were able to listen in to our business discussions, where we 'bargain' back and forth about the fees, etc. for the Mokuhankan printing jobs, you would probably shake your head. Instead of what you might expect - the publisher trying to drive the printing costs down as low as possible, and the printer trying to get as much as he can - we are both so concerned about the 'other guy', that we sometimes end up bargaining in reverse! I need this guy to be successful, and happy about his work. And he needs the publisher to be successful, and happy to use his services. He and I are both 55; so there should still be plenty of time for quite a nice pile of prints to get done before we have to hang up our barens! I'm looking forward to many years of working together! Whenever our family conversations turn to discussions of the 'good old days', my mother has a few stories about her 'children' she never tires of telling. It might be the story about my baby brother climbing a high ladder one day, or about how my sister used to dress the family cat in baby clothes and push it around in a buggy. When it comes to my turn, she likes to reminisce about the time I attended a pre-school in London, when I was four years old. The school was located a couple of stops away on the subway system, and she says that I went to school every morning on the train alone. She says that I insisted, "I want to do it by myself!" Now a desire to 'do it by myself' of course isn't something peculiar to me; there is a standard joke for example, that men will never ask for directions, because they want to 'do it by myself'. But I do think that I have this 'bug' in a particularly strong version; many times in the early days of my printmaking, I would have been far better off to have looked for advice more often than I did - it would have saved me a lot of grief. But no, I want to 'do it by myself'. Perhaps you can guess what I am getting at with this preamble. For nearly twenty years, I have been publishing sets of prints based on designs by other people. I have published every print, have carved every line of every block, and have printed every colour on every sheet ... but always the designs were taken from pre-existing work. Yes, for my next series, I am going to 'do it by myself' - it will be a series of original prints. Let me tell you some details of what I have in mind ... a print series of course, but a print series with a very special difference! To 'double the pleasure' for the collectors, every print will be issued in combination with a chapter of what will become a complete book once the set is finished. In an equal partnership, the prints will illustrate the book, and the book will provide depth and background to the prints. Ever since childhood I have been interested in outdoor life, making frequent hiking and camping trips. In recent years I have explored areas near my Ome home, and have discovered three 'private' places to which I frequently return - one on a quiet river, one deep on a forested mountainside, and one on a deserted stretch of seacoast. In this series, the collectors will come along with me, as I return to these places with my camping gear - notebook and sketchbook in hand. The complete series will consist of 12 prints, based on designs created during four visits to each location - once in each season. That would make a logical one-year project, but one month isn't enough time for all the work that will be necessary to create each print, so they will be issued at two month intervals, beginning in early summer of 2007, and running through to the spring of 2009. What will we see in the prints? As you can imagine, we will see the beauty of these Japanese landscapes in all weathers and all seasons. What will we read in the book? Readers of my stories know that it is useless to predict where the 'thread' will go. While sitting on a peaceful river bank, I will see a bird fly overhead, and the story will fly away just as freely as the bird. Once the series has proceeded far enough along to allow for accurate measurement, a wooden storage box in which to keep the set of 12 volumes will be offered. Many of the collectors have been suggesting and requesting for years that I should produce some original work, but I have always resisted. I have hidden behind my knife and baren - tools with which I have become very comfortable over the years - and have flatly refused to consider such an idea. What I say next may seem to be a bit of a contradiction, because even as I write this I am still struggling with the extremely difficult printing of the large scroll print, but I think I have become somewhat complacent about my work in recent years. When I head downstairs into my workshop every day, I know what I will be doing, and I know how to do it. I am not bored, not by a long shot - the work is too difficult for that - but there is no question that I am in a kind of 'routine'. Almost exactly twenty years ago, I was working in a music store in Canada, happy and productive, good at my job, but very much in a routine. We all know what happened; I gave my notice, brought my family to a new country, and carved out a new life. Nothing so dramatic will happen this time. I will still make prints, carving and printing every sheet, then sending them out to waiting collectors, as I have been doing for so many years. The only difference will be that now, at the beginning of each one, I will be faced with that very white, very empty, blank sheet of paper. "I don't know about this, Dad ..."
So it seems as though my 'fan club' is evenly divided on their confidence in my ability to pull this off. I hope that you too, will think that "this is going to be fun to see," and that you will consider entering a subscription to the series. Thank you for your support for this adventure! I've been trying to remember the first time that David and I travelled abroad together; if I remember correctly, it must have been more than ten years ago, when we first went to Vancouver to see David's two daughters. Even though I knew he was familiar with going on long trips, I was still shocked to see him wearing a pair of sandals on an international flight! With his boarding pass and passport tucked into his shirt pocket, moving easily through the the check-in and inspection stages, he looked as though he was going to board a local bus! To this description of what he is like, if I add that I am the type who quite easily gets nervous, you can see that the combination always makes our travels ... 'interesting'! 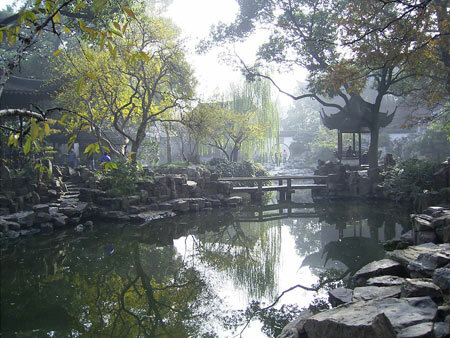 Last month we took a trip to Shanghai, to look for a place where his scroll prints could be mounted. Almost everything about the trip was doubtful: neither of us understood a word of Chinese, and we had no idea where we would be able to find such a place. 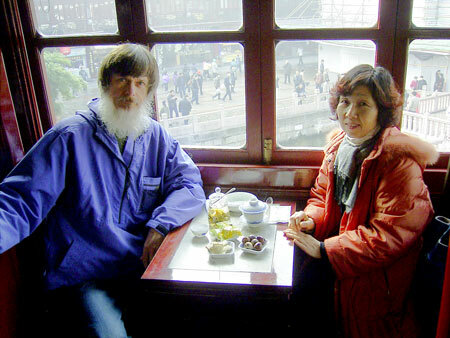 He had the vague idea that we should search around Suzhou, a city one hour by express train from Shanghai. Because Japanese and Chinese share some written characters, I would be able to jot down simple things in my small notebook to try and communicate, but the rest was all body language. I was very apprehensive about the whole thing, but David's eyes were glittering with excitement at just the thought of it all. We looked at each other, smiled, and said, "Let's go!" The first night there I was so frightened! After arriving at our hotel around seven in the evening, he suggested that we go for a walk. Well ... fine, but no sooner had we stepped out of the hotel than a flock of beggars were at our heels, shaking paper cups and shouting "Money! Money!" Two strange old ladies were at the forefront, and then a decrepit old man took his turn. As we moved down the street, we had to step around cars parked in our way, and gangster-like men stood here and there along the road. I clutched at David's arm and almost begged to return to the hotel, but he was intent on seeing what there was to see. As I couldn't possibly return by myself, I reluctantly went along, but walked with my knees trembling. Reading this, you may tend to think that David was being quite imprudent, and may sympathize with poor Sadako! But the reality was just that the two of us were seeing this new environment in completely different ways. In one sense, David was able to see a bit of what I couldn't see - people in different cultures behave differently. Shouting in a loud voice isn't necessarily an indication of fighting; staring boldly at somebody doesn't mean anything wrong. Many of the beggars we saw during our stay are quite harmless, and begging is just their 'occupation'. There were perhaps some people who could have been dangerous to us, but such people exist in any country. I rapidly got used to this new environment, and just 24 hours later I was completely fine. I strode out into that same street the next night, and chose the restaurant for our dinner, where we enjoyed a tasty hot-pot meal, at a very reasonable price! The six days passed quickly; and sitting in the boarding area of Shanghai airport for our return flight early in the morning, we reviewed our trip. We had managed to find nice people to do Dave's scroll mounting work, and we had enjoyed a pleasant couple of days as tourists; I was thinking that I would surely answer 'yes' if Dave were to ask me to return again in the future. But all of a sudden David became quiet, and after a moment he said, "You know, that first night ... Honestly speaking, I was sure that when we got back to our room, you were going to get right on the phone to the travel agent, and book a seat on the first plane home the next morning!" That's it for this time ... I'm now buried in work getting the scroll print finished, and of course, trying to put together the upcoming exhibition ... See you there I hope!